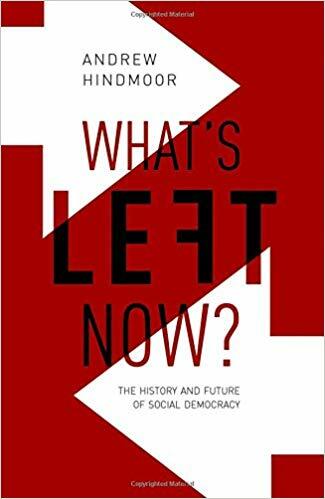 Andrew Hindmoor's monograph on the future prospects for British social democracy is one of the most important to have been written on the left for some years. Hindmoor is an academic who refuses to indulge in comforting intonations about the evils of Thatcherism and neo-liberalism. Not everyone will agree with his analysis, particularly Hindmoor's assessment of the post-1997 Labour governments. But anyone with an interest in progressive politics should engage seriously with the arguments in What's Left Now? Hindmoor begins by taking issue with the orthodox left's interpretation of history. He contends that the British left, despite its claim to temperamental optimism, ‘holds to a remorselessly bleak and miserabilist view’. The sense of gloom and negativity is deeply ingrained. It has long been the case that intellectuals on the left and the right of the Labour party were pessimistic about the long-term prospects of the Labour movement. Both wings of the party were grappling with the same existential question: why was it that in the era of full franchise mass democracy, Labour was not more successful in winning elections, remaining in government, and carrying out a radical socialist programme? Left intellectuals like Ralph Miliband, the author of Parliamentary Socialism, argued that Labour failed to command the allegiance of the working class. It was a labour party, not a socialist party. Labour's electoral performance was weak as working class voters grew increasingly disillusioned. Wilson in the 1960s and Blair after 1997 lost the support of the party's core social constituency. Labour was then roundly defeated. Miliband claimed the party would never succeed as a conformist, insular, middle-of-the-road movement. On the Labour right, David Marquand insisted the Labour party was enfeebled because it was labour, saddled with old-fashioned institutions such as the trade unions that inhibited the party from winning the allegiance of a broad alliance of voters. Throughout the post-war years, it was feared that class dealignment and structural change were eroding Labour's electoral support. The advent of Thatcherism thus confirmed what many on the left most feared. The tide of history was moving inexorably against socialism, transforming Britain into a selfish and individualistic society prone to perpetual Conservative rule. What's Left Now? directly confronts this pessimistic view of history. Hindmoor advances two central propositions. Firstly, Labour governments make a positive difference, enacting vital social reforms that generally make Britain a more progressive country. Secondly, he argues that Britain in the last three decades has certainly not become ‘a poster-child for neo-liberalism’. What's Left Now? is especially critical of the contention that New Labour was beholden to neo-liberalism, offering Thatcherism with a human face. That said, Hindmoor is not oblivious to the failings of the Blair–Brown administrations. He accepts that the military invasion of Iraq may well have been a monumental foreign policy error. The book is especially strong on the origins of the British housing crisis, and the link between housing and rising inequality. The richest spend proportionately less of their income on housing, but live in far nicer houses and neighbourhoods than the poor. Hindmoor persuasively demonstrates that the disaster of UK housing policy is not that government has pulled back and spending has been slashed since the 1970s. As fewer houses were built, the state spent more on subsidising the housing costs of low income families in private rented accommodation. Local authorities across England after 1997 failed to construct more affordable homes for ‘social rent’. New Labour was slow to acknowledge the severity of the housing crisis, and its encouragement of a more unequal society. Yet What's Left Now? 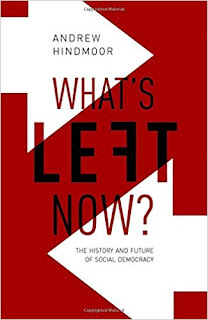 emphasises that British society has not moved unequivocally in a rightward direction since 1979, nor has it been irrevocably shaped by neo-liberalism. All sorts of paradoxes and contradictions have emerged. For example, Thatcherism certainly drove a wave of middle class prosperity in the 1980s which made Britain more than ever a country of ‘two nations’. The long-term consequence, however, wasn't that more affluent citizens simply retreated into enclaves of ‘private affluence’. These voters became even more concerned about ‘public squalor’ and the state of public services, particularly health and education. During the 1980s and early 1990s, public support for higher spending rose dramatically. This paved the way for an extended period of New Labour hegemony after 1997. If the British left does have a strategic vulnerability that undermines Labour's ability to win elections and enact a transformative programme, it lies in the sphere of economics. Hindmoor acknowledges the seismic impact of the 2008 crisis. The financial crash undermined Labour's economic credibility because the party was in power when the crisis struck. The fiscal aftershock that came after meant there was no money left for additional public spending; in these circumstances, what was the Left now for? After 2010, the Labour party sought to oppose ‘Tory austerity’; but what was Labour's alternative? Labour's 2017 election manifesto was heralded as a vote winner for the party, the most radical programme since 1945. But aside from calls for a more active state, greater public investment and nationalisation of the major utilities, there is little sign that as yet Labour has been able to map out a coherent economic strategy. A Labour administration led by Jeremy Corbyn would face the same problem that all Labour governments have confronted. It would seek to rein in the excesses of British capitalism but the British state would still be structurally dependent on a capitalist economy. Not surprisingly, the Shadow Chancellor, John McDonnell, has recently adopted more conciliatory rhetoric towards the City of London. On the UK's relationship with the European Union after Brexit, the Labour party is closer to corporate business interests than the May government, signalling its support for a modified customs union, and potentially ongoing membership of the European single market. To be sure, Corbyn's party has aspirations to dramatically expand the role of the state. But would the next Labour government really be in a position to alter the underlying forces and dynamics of the British economy that have led to plummeting productivity, major regional imbalances, and soaring inequality over the last thirty years? Too busy railing against the bogeyman of neo‐liberalism, Hindmoor's book is a reminder that unless the left is prepared to develop serious, intellectually coherent ideas, its chances of success in transforming the economic and political landscape of Britain are likely to be extremely limited. Patrick Diamond is Senior Lecturer at Queen Mary, University of London. What's Left Now? The History and Future of Social Democracy, by Andrew Hindmoor is published by Oxford University Press. 285 pp. £20.00.